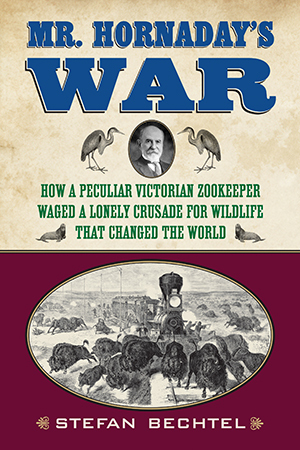 Mr. Hornaday’s War is a long-overdue biography of William Temple Hornaday, first director of the Bronx Zoo, who helped launch the American conservation movement. Mr. Hornaday’s War restores this major figure to his rightful place as one of the giants of the modern conservation movement. But Stefan Bechtel also explores the grinding contradictions of Hornaday’s life. Though he crusaded against the wholesale slaughter of wildlife, he was at one time a trophy hunter, and what happened in 1906 at the Bronx Zoo, when Hornaday displayed an African man in an “ethnographic exhibit,” shows a side of him that is as baffling as it is repellent. This gripping book takes an honest look at a fascinating, enigmatic man who both represented and transcended his era’s paradoxical approach to wildlife, and who profoundly changed the course of the conservation movement for generations to come. But the light snow made conditions perfect for tracking, so Hornaday and McNaney rode out away from the wagon train in search of game. They had crossed two or three snowy ridges, then began descending through steep country toward a dry river bottom, when Hornaday spotted the light-brown humps of three buffalo, about 200 yards away. The buffaloes appeared to be a youngster, perhaps two years old; an old cow; and an immense bull, the largest Hornaday had ever seen. He and McNaney jumped off their horses and ducked behind a clump of sagebrush, but the animals spotted them and took off through the snowy ravine at a slow trot, kicking up a spray of snow as they ran. Hornaday stood up, squared himself into a wide stance, and got off a couple of shots with his .44¬±40 Winchester buffalo rifle, but both bullets missed. Even so, Hornaday’s grim prediction, in 1889, that all the wild buffalo would be gone within ten years proved prophetic. In the winter of 1893¬±94, poachers killed 114 of the last band of wild buffalo cowering in the newly created Yellowstone National Park. And in 1897, the last four free-roaming buffalo were found in a high mountain valley in Colorado and shot. The hunters must have been exultant. They had succeeded in killing off the very last wild buffalo on the planet. It was only because there were a few animals still sheltered in private reserves or zoos, which would later be used to seed new herds, that the buffalo survived at all.